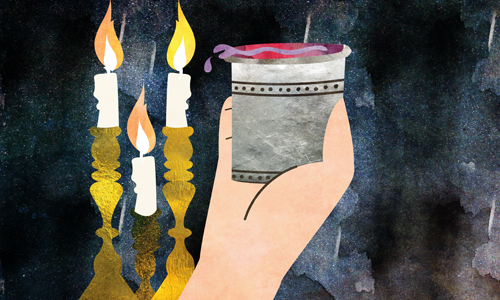 The word kiddush has at least three meanings, each one built on the one before it. Let’s start at the beginning. The Hebrew word kiddush translates as “sanctification” or “separation.” It’s a mitzvah to verbally declare Shabbat, the seventh day of the week, separate and holy. We do this on Friday nights—once during prayers, and then again holding a cup of wine before we begin our evening meal. This declaration of sanctification is known as kiddush. The declaration is comprised of three parts: recitation of verses from the Torah regarding the holiness of Shabbat (taken from the verses in Genesis that describe the first Shabbat in history, right after G‑d created the world), the blessing over the wine, and a blessing in which we thank G‑d for having chosen our nation and given us the gift of Shabbat. You can find the text for the Friday night kiddush here. As an extension, we also hold a cup of wine and recite Shabbat rest–related verses and a blessing over wine before we begin our Shabbat daytime meal. You can find that text here. In many synagogues, morning services are followed by a reception. Since it is preceded by the blessing over wine, the reception is often called a kiddush as well. (It is sometimes called an oneg.) Kiddush fare can range from basic herring and crackers to elaborate meals with carving stations and sushi. People often sponsor these kiddush receptions in honor of milestones, in memory of loved ones, or just because. We thank G‑d for the gift of a new baby girl. At the kiddush, it is customary to wish the parents that they raise their child to “Torah, chuppah, and maasim tovim [good deeds].” Blessings are very potent, and the kiddush celebration is a great way to snag as many blessings as possible. Note: When a person says he is “making kiddush,” you know he is referring to the blessing over wine. However, if he says he is “making a kiddush,” you can assume it means he will be sponsoring a reception on Shabbat morning. Holiday Kiddush: Like Shabbat, we say declarations over wine before the meals on major Jewish holidays. These are also known as kiddush. What Are the Kiddush basics? Why does the kiddush precede the blessing on the bread? What’s Up with Making Kiddush? I shall not want So blessed, the words of the Friday Kiddush. What a simply lovely article The complexities of Judaism are a magnificent testament to its simplicity! This article is the KEY to the opportunity to write more on such, seemingly, simple subject within Judaic framework that is so badly needed. This article and others like it would make a fantastic book as well!